Famous for the wonderful aria ‘Nessun Dorma’, Turandot has plenty more gorgeous music. Here’s everything you need to know. Giacomo Puccini. Born in Tuscany in 1858, Puccini is an Italian composer who took Verdi’s crown as the most prominent composer of Italian opera in his day. Renowned for his love affairs, Puccini left a trail of broken hearts across Italy, but also left us music-lovers 10 beautiful operas, three of which are regularly in the top 10 of operas performed around the world. Puccini’s music is sweeping, uplifting, enchanting and always intensely moving. His real genius, however, was to combine that music with stories about ordinary people. The composer himself once said his success was due to putting “great sorrows in little souls”. Giacomo Puccini at the piano (Alinari Archives, Milan). Turandot is a beautiful and brutal princess, who challenges her many suitors to answer three riddles on pain of death. No one has ever succeeded. Calaf is a brave, selfish prince from a different land, who watches the princess behead a rival suitor and falls instantly in love. Despite the wishes of his exiled father and the pleas of a slave-girl who loves him, he rings the gong and declares his suit to the princess. She presents her riddles, and in triumph, the unknown prince answers. Turandot despairs and the prince takes pity – offering the ice-cold princess a riddle of his own. But Calaf’s riddle risks more than his own life – everyone else’s hangs in the balance. Liu – a slave girl to Calaf’s father, Timur. She loves Calaf, who once smiled at her. 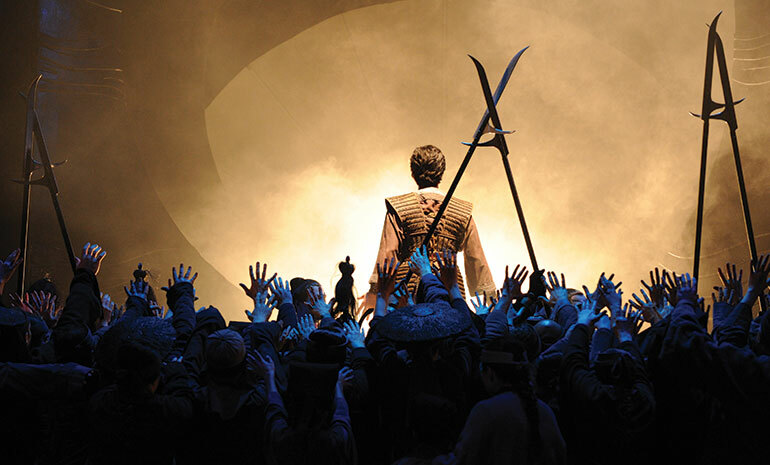 An image from Opera Australia's 2015 production of Turandot. Photo by Branco Gaica. It’s bigger than big, it’s the biggest. ‘Nessun Dorma’ is probably the most famous aria ever written. Listen to this clip to see why! Puccini based several themes in Turandot on traditional Chinese melodies. Listen out for the folk melody “jasmine flower”, first sung by the children’s chorus in act 1. You’ll hear it again and again through the opera – it’s a sort of ‘leitmotif’ or theme for the princess. Turandot is scored for a large orchestra including 13 tuned Chinese gongs – a full chromatic scale! Listen out for all of the fun percussion in this opera – including tubular bells, an on-stage wood block and on-stage gong. The opening five chords represent an executioner’s axe falling – hear the descent, the impact and then the head hitting the ground! A theatrical, visually arresting production created by director/choreographer Graeme Murphy. He uses colour, flow and the beauty of mass human movement to create striking patterns on stage. By creating a China of fable and fantasy, Murphy avoids the difficulties of Puccini’s uncomfortable orientalism and revels in the beauty of the exotic world Puccini was striving to capture. Dancers in Opera Australia's 2015 production of Turandot. Photo by Branco Gaica. Turandot was Puccini’s last opera, and wasn’t quite finished when he died in 1924. This gives it both a significance and a complexity – it’s a great composer’s last opera, and displays some interesting developments in his style. On the other hand, he left it unfinished, and although one of his students wrote an ending that we perform today, it isn’t perfect, and the results are a little unsatisfying. We can’t be too hard on Alfano – the finishing composer – Puccini struggled desperately with the end of the opera, and there is no telling whether he himself could have resolved the opera’s difficulties. The problem lies in the libretto. While the story thrilled Puccini, (he savoured “the clear and moving humanity that is in this story, full of poetry and special perfume…”), the cruel heroine left him a bit cold. So he invented a slave girl, Liu, who loves purely, and gives her the best of the music and most of his sympathy. It makes the ending tricky, as [spoiler] the composer has to somehow get the icy princess and the bombastic prince together seconds after Liu commits suicide. Puccini had composed most of Turandot – up to the final scene by March of 1924, but still hadn’t worked out how to finish it when he set it aside for cancer treatment in November. Perhaps he knew what was coming, as he visited the maestro Toscanini and said, “Don’t let my Turandot die!”. 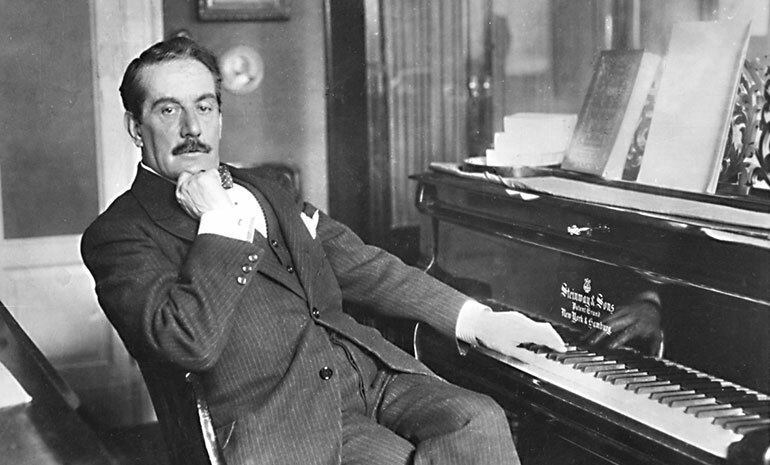 Puccini had a heart attack on 29 November 1924. Turandot premièred in 1926, one year and five months after the great composer had died. After Liu’s death scene, Toscanini laid down his baton, saying something to the effect of “At this point the maestro laid down his pen”. 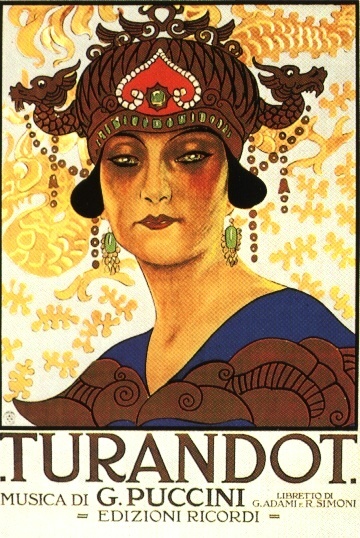 Turandot was soon performed at all the major European houses and reached even Australia by 1928. It is now a staple in the repertoire, and although several composers have made an attempt to write the definitive ending, today we usually hear a shorter version of Alfano’s original. Puccini actually pronounced ‘Turandot’ with a silent ‘t’ at the end, as Turando, according to Rosa Raisa, who sang the first Turandot. Puccini first heard some of the Chinese folk melodies in the opera in a music box – a gift from an Italian diplomat to China. He used three of the music box melodies in the opera, including the jasmine theme. Turandot was not performed in China until 1996, as the opera paints a one-dimensional and not very flattering picture of China. That incredible top B in ‘Nessun Dorma’ is only written as a tiny grace note, meant to be sung quickly! But tenors like to show off their top notes, so it has become tradition to hold it forever before resolving to the A at the end. For most tenors, that B is at the top of their range. The composer: Puccini. Italian. Late 19th Century. Also famous for Madama Butterfly and La Bohème. The big hit: 'Nessun dorma' - the hit that became a global sensation when Pavarotti sang it at the FIFA world cup. The setting: A mythical version of China, at any time during China's imperial history. The tragedy: Puccini didn't live to finish Turandot - one of his students wrote the ending we perform today. A quirky fact to impress your date: Puccini took some of the Chinese melodies in the opera from a music box - a gift to the composer from an Italian diplmat to China.